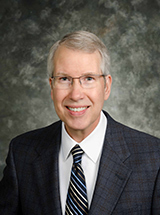 Dr. Hund graduated from Newman University in 1974 and the University of Kansas School of Medicine in 1978. Upon completing his residency at Children's Mercy Hospital in Kansas City in 1981, he returned to his hometown of Wichita to practice general Pediatrics. In 1983, he founded Mid-Kansas Pediatric Associates, P.A. Dr. Hund attributes MKPA's growth and the high standard of care provided by our practice to the many well trained and dedicated doctors and staff who have joined him over the years. Partnering with parents to provide the best care possible for their children attracted Dr. Hund to the practice of Pediatrics. He is trilled by seeing his patients grow and thrive, both physically and developmentally. In recent years, he has enjoyed providing the medical care for the children of many of his original patients. Dr. Hund married his wife, Margy, in 1977. They have daughters Alison, Carolyn, and Laura, and five grandchildren.